Create an onboarding task checklist for your company's new hire onboarding process. You can create your company's template for all onboarding tasks needing to be completed by and for new hires. 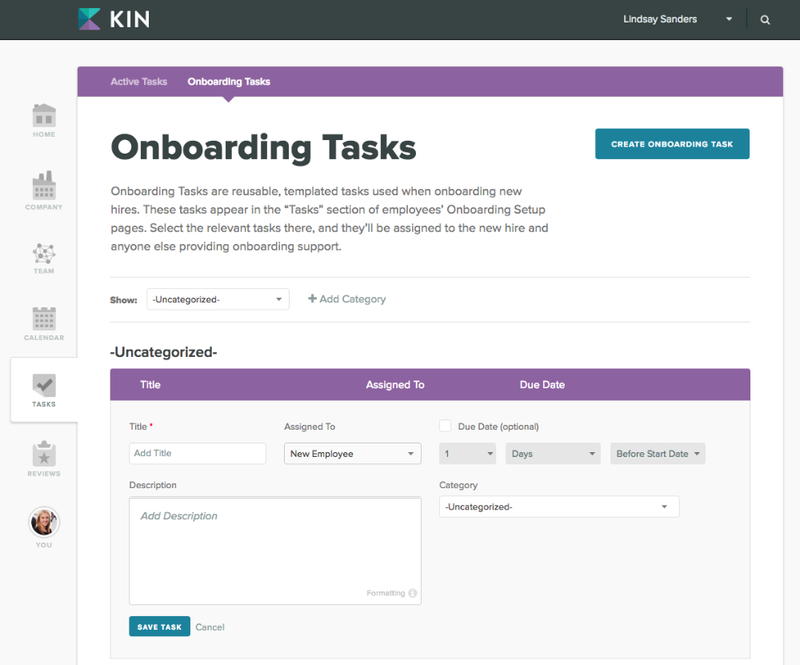 Once you have your template set, you'll select those tasks that apply to a new hire from their Onboarding Setup page. Under Tasks > Onboarding Tasks, click the Create Onboarding Task button. Enter a title, description, and assignee for the task. An onboarding task can be assigned to the New Employee, a Manager, HR Manager, or HR Support User. Set a due date for the task by selecting the number of days, weeks, or months before or after a new hire's start date. Create categories for your tasks to help easily organize your checklist, as well as to quickly select tasks for new hires. For example, you can have a category for "All Employees" for those tasks that apply to every new hire. Have a distributed team? Create a "Remote Employees" category for tasks that only remote new hires need to complete.